Welcome to our Spring issue. By the time you read this issue, Brexit might have happened - or it might not. A delay is looking likely, so there is still time to kickstart your overseas property plans in 2019. Perhaps the following features will offer some guidance. The Algarve: coast vs country - would buying or living inland suit you better than by the beach? Bulgaria: time for buyers to take a fresh look? The Canaries: which island would suit you best? Get your copy now to make your overseas property venture even more exciting, stress-free and seamless, by clicking below. To subscribe to the print edition of the magazine for only £12 click here and complete the form. 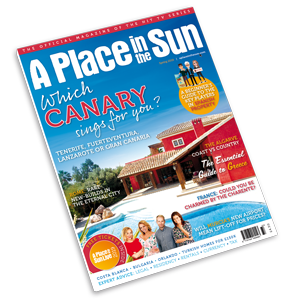 The A Place in the Sun magazine is also available in digital. To subscribe to the digital edition of the magazine for only £7.99 download the app for free in the App Store, Google Play or Amazon. A Place in the Sun magazine is issued 4 times a year.